A pig under a roof can mean home or family (jia ) and it is also a very popular name for Chinese girls. Chinese writing is made up of 214 radicals or elementary pictures. By combining the radicals of pig and roof, we get jia. This tells us a lot about the value that Chinese people place on the family and of course, the pig. 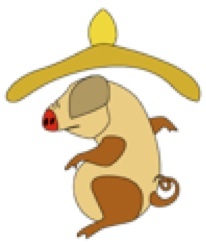 In ancient China, the farmer probably valued his pig more than his wife or female daughters. Jia, ideographically also implies that the woman’s place is in the home. Sociologically speaking, language constructs realities, and intrinsic in any language are stories which hint at values shared by a group of people. It is common knowledge that we Chinese, like most sinitic or chopsticks people (i.e Japanese, Vietnamese, Koreans) have a family-centred culture; a jia culture.